Samsung Galaxy Watch Active review (early verdict): finally a true Apple Watch rival? The Samsung Galaxy Watch Active is the best smartwatch Samsung has ever made, yes, even better than the Samsung Galaxy Watch. We're calling it already, and we can't wait to test is further. The Samsung Galaxy Watch Active is here, officially announced along with the new Samsung S10 smartphone at Samsung Unpacked 2019, and judging from our brief hands-on time with the new smartwatch, Samsung seems to have delivered a more stylish sequel to the Gear Sport that should also appeal to a broader audience. It's that redesign which is key to the success of the Galaxy Watch Active, as despite this new smartwatch packing some neat new features, the fact that it looks sleeker and more sophisticated will no-doubt be the foremost decider in whether potential adopters pull the trigger. As to whether Samsung now has the weapon in its locker to take down the Apple Watch remains to be seen, but from what we've seen, it genuinely looks like Samsung has created an Apple Watch alternative for Android users. Here are our initial thoughts on the Samsung Galaxy Watch Active. The Samsung Galaxy Watch Active price will, for long standing fans of the series, come as a pleasant surprise, as it starts cheaper than the Samsung Galaxy Watch did at launch. The watch is priced at just £229, making it one of the most affordable smartwatches out there. Straight out of the box the first thing that grabs you about the Samsung Galaxy Watch Active is the modern, sleek design. It's a complete departure from what Samsung has done before. I really like it. It's comfortable on the wrist, with its rounded edges and smooth surfaces. You could quite easily put it on a forget you're wearing it. In terms of exterior functionality, the Galaxy Watch features some side-mounted buttons. It doesn't have a rotating bezel, like previous smartwatches. It'll take a while to see if that's no big deal or a big disappointment. The Samsung Galaxy Watch comes in a single size, but it's nicely proportioned, and can fit both small and large wrists. There are versions in black, silver, rose gold, and blue. Our favourite is the silver model. The Galaxy Watch Active, which has a 1.1-inch display and overall dimensions of 39.5 x 39.5 x 10.5mm. It weights just 25g. It has enough space for a 230mAh battery inside, which almost half the size of the Samsung Galaxy Watch. It should still be enough to keep it alive for a whole day, but we'll have to wait and see about that. Finally, in terms of hardware, the Galaxy Watch Active features the same dual-core 1.15GHz chipset and 4GB of internal storage space as the Samsung Galaxy Watch. It's waterproof to 5ATM and rated at IP68. As the name suggests, health is a major focus for the Galaxy Watch Active, and as such Samsung Health is now expanded with new stress management and breathing features, as well as a collection of 21 indoor exercises and 39 tracked workouts. You can easily switch between the various tracking functions and modes by flicking through the new UI. In a first for smartwatches, the Samsung Galaxy active is also capable of Blood Pressure Monitoring. All you need to do it download My BP Lab, the research app jointly developed with the University of California, San Francisco (UCSF), directly to Galaxy Watch Active to monitor blood pressure and keep better track of your physical health every day. In other feature news, the Galaxy Watch Active features Bixby, Samsung's AI voice assistant. I didn't get chance to try out Bixby on the Galaxy Watch Active during our brief hands-on session though, so I will withhold judgement until I can test it out properly. If it's anything like Bixby on the Galaxy Watch, it'll be a frustrating and disappointing experience. 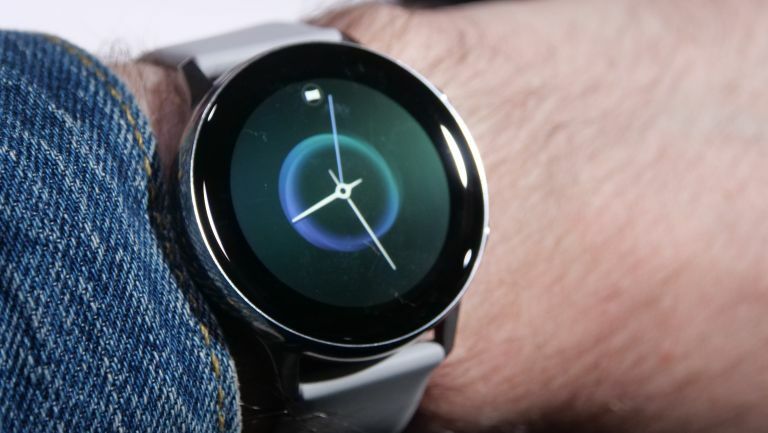 In terms of OS, the Galaxy Watch runs Tizen, now in its 4.0 incarnation. This is compatible with all Android phones that are running Android 5.0 and later, and it will also work with any iPhone running iOS 9. It does feature a new UI, the initial impressions of which are positive. Time will tell whether it's slick enough to make me not miss the rotating bezel. Again, I didn't have chance to check the limits of functionality and compatibility with iOS on the hands-on session, so again it will be worth holding off for T3's full Galaxy Watch review. The Samsung Galaxy Watch Active is the best smartwatch Samsung has ever made, yes, even better than the Samsung Galaxy Watch. We're calling it already. In my opinion, it far more stylish than previous incarnations of the smartwatch, and comes packing some neat new abilities such as Bixby Voice and competitive water resistance, making for a compelling package. Its new watch faces, too, give it a modern edge, while its comfortable, sleek design will help it appeal to more people. Best of all, it's just comfortable to wear. We're looking forward to spending more time with the Samsung Galaxy Watch Active over the coming week, so be sure to check back in to T3 for our full review.